To maintain the aquarium layout in good condition, regular water changes are essential. When you do water changes for your aquarium, the thing to do is to fill the tank with new water. We usually pour tap water into the tank, but tap water contains residual chlorine and chloramines that is harmful for fish, shrimps and helpful bacteria. 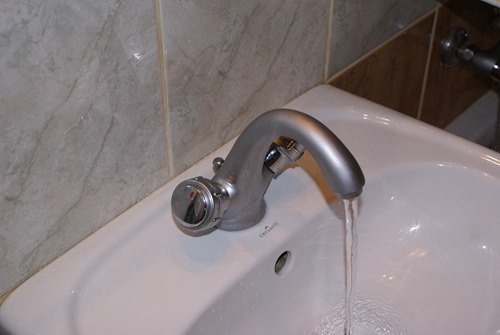 Using a water conditioner or dechlorinator helps to remove residual chlorine and heavy metals from tap water. Why tap water is not ready for fish? In water treatment plants, chlorine is added to water for the purposes of sterilization and it still remains in the water we get from the tap. This chlorine found in tap water is called residual chlorine that is harmful to living creatures in your aquarium including fish, plants, shrimps, and helpful bacteria. Residual chlorine concentration in tap water varies depending on season and location. It tends to be lower in summer when the temperature is high because the chlorine evaporates more easily in higher temperatures, and the concentration tends to be higher in the winter when less chlorine evaporates because the weather is colder. As for location, the chlorine concentration is higher in urban areas and areas closer to water treatment plants. Residual chlorine is harmful to some living organisms such as fish and shrimps, and there is even a risk of sudden death for these organisms if the chlorine concentration is very high. In addition to this, given that chlorine is designed to sterilize water, it is obviously harmful to microorganisms including beneficial bacteria that living in your aquarium and filter media. 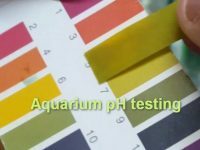 Beneficial filter bacteria killed by chlorine will intermediately result in cloudy aquarium water and deterioration in water quality. If you only have a small aquarium, you could easily eliminate chlorine from a small amount of tap water by leaving it on the air for 3-4 days. This means you have to store tap water in a separate container to only use for aquarium water changes. You can use an air pump to better aerate the water. Although this method is cheap and simple, you have to wait for a long time until the water can be used. This method can’t remove heavy metals in tap water, too. Heavy metals, another threat of aquarium fish and shrimps, can’t be naturally degraded by aeration. If your aquarium is large, you need a huge amount of tap water. It is harder to completely dissipate all chlorine in a large volume of tap water for several days by aeration and you need to use a water purification system. It may take you a lot of money to acquire a water purification system that is large enough to process a huge amount of tap water for an aquarium. Residual chlorine in tap water is easily eliminated by using an aquarium additive (conditioner or dechlorinator). A good water conditioner will neutralize chlorine, chloramine and heavy metals in the tap water but not affect the water chemistry of the aquarium. Some conditioners also help regenerate the slime coat of a fish, a protective layer over the scales that keeps them healthy. A good water conditioner is very necessary for setting up as well as maintaining an aquarium that decides if you succeed in the fish keeping hobby or not. Following are some of the best water conditioner you should use for your aquarium. Seachem Prime instantly removes chlorine, chloramines and detoxify heavy metals from tap water. It helps to remove ammonia. It also promotes the production and regeneration of the natural slime coat of fish (a protective layer over the scales) that is very good for the health of your fish. A single 100 mL bottle will treat 1000 US gallons of tap water. It is much more economical than other conditioners. For using, add 1 capful (5 mL) for each 50 gallons (200 L) of new water. API Stress Coat Water Conditioner instantly removes chlorine, chloramines and detoxify heavy metals from tap water. It helps to remove ammonia intermediately. It contains the healing power of aloe vera that protects the mucous membrane of the fish that is interrupted by handling, shipping, fish fighting, or other forms of stress. Usage: add 5 ml water conditioner per 10 U.S. gallons (38 L) of aquarium water. 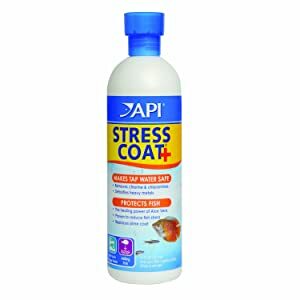 API Stress Coat Water Conditioner and Seachem Prime are two of the best water conditioners that are chosen by thousands of aquarists who have been successful to keep their fish healthy for many years. Besides dealing with chlorine, both products also help to remove ammonia – a nitrogenous toxic which is very dangerous for your fish. Because of this, they are also helpful to save your fish pets in cases of emergency that ammonia concentration suddenly increases.